VietNamNet Bridge - Distributed electricity generation is believed to be a good solution which could help satisfy Vietnam’s demand for power, experts say. On a quiet street in HCM City, Tuan's one-storey house is covered with sunlight dancing through the ceiling, interlaced with light and photoelectric panels. The 3kW solar power system helps him save one-third of his electricity bill every month and the figure will be even higher if he can sell electricity to the Electricity of Vietnam (EVN). The development of high technologies plus the state’s encouragement and awareness of ‘green living’ all have ignited a solar power movement in large cities. 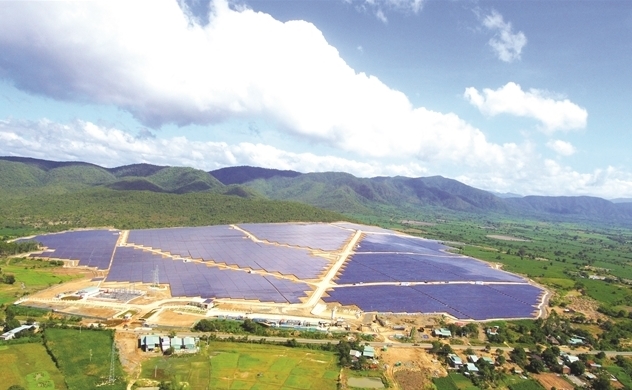 Experts believe that distributed electricity generation, with numerous electricity generators connected to the national grid, can help ease the energy burden on Vietnam, with the annual growth rate of 8 percent for the next decades. Germany, Australia, Canada and New Zealand use renewable power as major electricity generation sources with the proportion expected to reach 80-100 percent in the near future. The World Bank said that the government needs $150 billion from now to 2030 for investment in electricity generation, transmission and distribution. The pressure will be mitigated if it can encourage investment from the private sector. A scientist said Vietnam, like other companies, is striving to develop smart cities in the future. In such cities, high technologies will help connect small individual electricity generation sources to form flexible power networks. Users will be able to watch the electricity output consumed and other information under SolarBK’s SSOC software. However, in order to build smart grids in smart cities, Vietnam will have to overcome legal and technological problems. Because of administrative issues, some people still are not paid for the electricity they provide to the national grid because EVN requires people to provide invoices. The other obstacle is unclear policy. No one knows what the renewable energy electricity price will be after June 2019. Meanwhile, technologically, any time a household installs solar panel and joins the grid, this will cause some interference. Single interferences won’t cause problems but disasters may occur if the electricity grid cannot be designed in a way to be bear a high number of interferences. According to SolarBK’s Mai Van Trung, the often-changing urban development program has made people hesitate to install solar power systems. It takes 10 years on average to take back investment capital. Meanwhile, investors cannot calculate risks when other buildings arise and block sunlight.